May I ask please - What style of kilt would you like to make? What fabric would you like to make your kilt from? The first one I build will be 16oz wool. But I do plan on using Marton Mills PV as well. Then may I suggest that you practice your hand stitching on the same fabric that you will be using for your kilt. Denim is not a very good fabric for kilts. It is tough to stitch through. 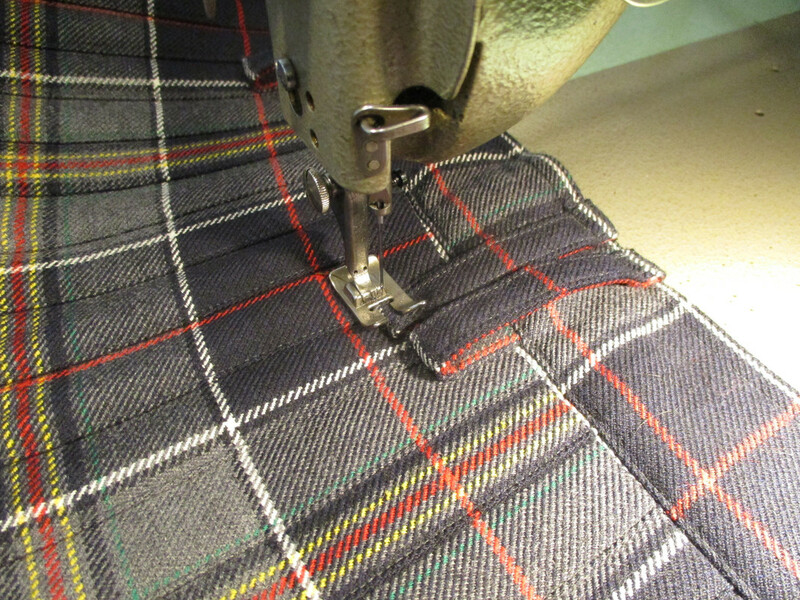 Good quality kilt fabrics are a dream to sew by hand. Using the same fabric to practice is by far the best advice anyone can give. The Polyester/Rayon blends that are woven by Marton Mills are also a very nice fabrics, but are not usually used when making the Traditional style kilts that Barb teaches. These are usually thought of as fabrics used in the Contemporary course and are usually machine stitched. If you do decide to attend the Contemporary course, "The Art of Kiltmaking" (TAoK) will give you the basics of kilt construction. In the Contemporary course we use "The Hand-Crafted Contemporary Kilt" as our text. All the students will receive a copy of THCCK when you arrive. My first question above was "What style of kilt would you like to make?" This is a very important part of deciding which course is best for you. If you plan to hand stitch your kilt and the style is the Traditional that is in TAoK, then you will want to attend Barb's course. If however you wish to stitch your kilt by machine, and plan on making a kilt in any other style than that in TAoK, then you want to sign up for the Contemporary course. Do you wish to wear your kilt at any waist height other than the anatomical waist? Do you wish to use fabrics other than kilt wool? Do you wish to have a different apron width, different fastenings, or other styling features such as pockets, than that given in TAoK? Then you want to tell Barb when you register, that you wish to take the Contemporary course. Students can move freely between the two courses. They are just down the hall from each other. But the methods and the types of styling are quite different. If you plan on machine stitching your kilt, you must bring your own machine to class. Last edited by Steve Ashton; 11th March 19 at 12:57 PM. Thank you. That’s a lot to consider. But yes, my first kilt will be a traditional, natural waist build. But I can see that it is quite likely that my first kilt camp will be followed by a second, as I do also wish to learn the machine sewn, contemporary, PV kilt ... with pockets. I suspect that all of my kilts will be worn at the natural waist, as I’ve a nice pooch belly that doesn’t want to leave, and I don’t think I’ll much care for my kilt hanging under it ... that looks bad enough with jeans. Again, thank you for your thoughts! A friend of mine's has found herself in possession of four sewing machines one of which she plans on keeping for herself. She, being aware of my desire to try my hand at kilt making, mentioned that one of the remaining three machines is a Singer Featherweight like or similar to this one: (https://www.ebay.com/i/132607690016?chn=ps Please note that I only included the link for the picture. She says it's in perfect working order and it might be a good machine for me. What I've gotten out of the sewing machine discussion here at XMarks is you don't need all the bells and whistles but a good solid machine is pretty much all you need. Not knowing anything about sewing machines (outside of home ec classed in middle school) can anyone in the Rabble offer some opinion on this? Before I add my two cents, realize that my perspective is from that of a traditional kiltmaker. A traditional, hand-sewn kilt is hand sewn, so no sewing machine necessary. The instructions in TAoK cover that plus the option of stitching the top band on by machine, which is the only part of a kilt that I would sew by machine. And, let me emphasize that this is not the "one right way to make a kilt". There are different ways to make a kilt. This is just that way that I make one. If you are following the methods in TAoK, all that's necessary is a machine that sews straight in one direction. Years ago, I even sewed top bands on using an old Singer Treadle sewing machine that didn't stitch backwards. The most important thing to remember about picking a sewing machine is the adjustability. Most machine sellers advertise how strong their machine is by sewing through multiple layers of leather. But that is more of a trick as almost any machine, with the right needles, will sew through leather. Almost any machine will sew through kilt fabric. But the big question is how many layers? It is not the strength of the machine that is the important issue but the space under the pressure foot. How high can the pressure foot be adjusted and still sew? One of the reasons I use industrial machines in my shop is that the pressure foot can be adjusted so that you can fit a lot of fabric under the pressure foot and it will still sew. When you raise the pressure foot really high, the timing of the machine must be adjusted so that the feed dogs do not bend the needle. My machines are currently set to be able to fit 1/2 inch of stacked up fabric under the pressure foot and the timing can be adjusted to still sew perfectly well. They can be set up to 1 full inch if that were ever needed. 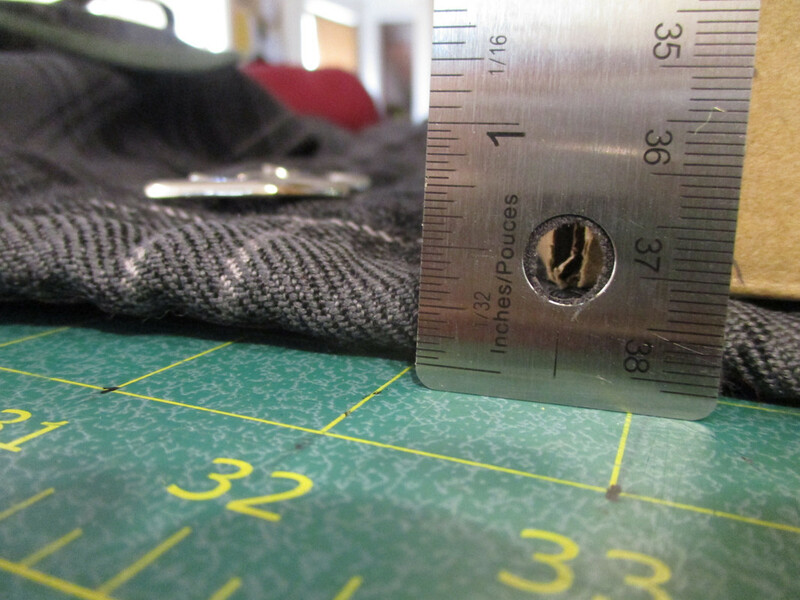 When sewing a kilt by machine, all the layers in the Fell, - plus - the waistbanding, - plus - any buckle tabs or sporran/belt loops, can quite quickly exceed the pressure foot and timing adjustability of most home sewing machines. Even a hand stitched kilt where the excess fabric in the Fell is cut-away can be surprisingly thick. 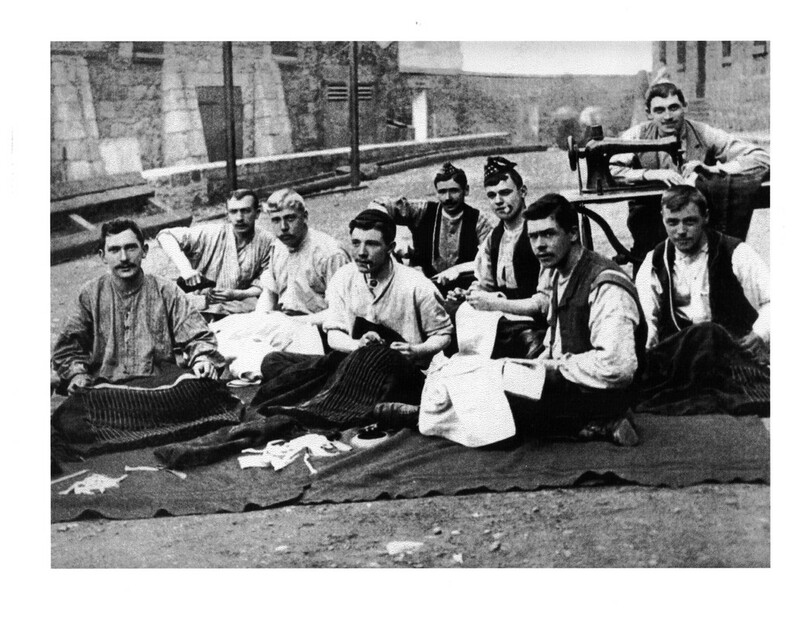 And if anyone is still under the impression that a kilt must be completely hand stitched to qualify as 'traditional', may I direct your attention to the sewing machine in this photo. The use of a sewing machine is not what qualifies the kilt as traditional. 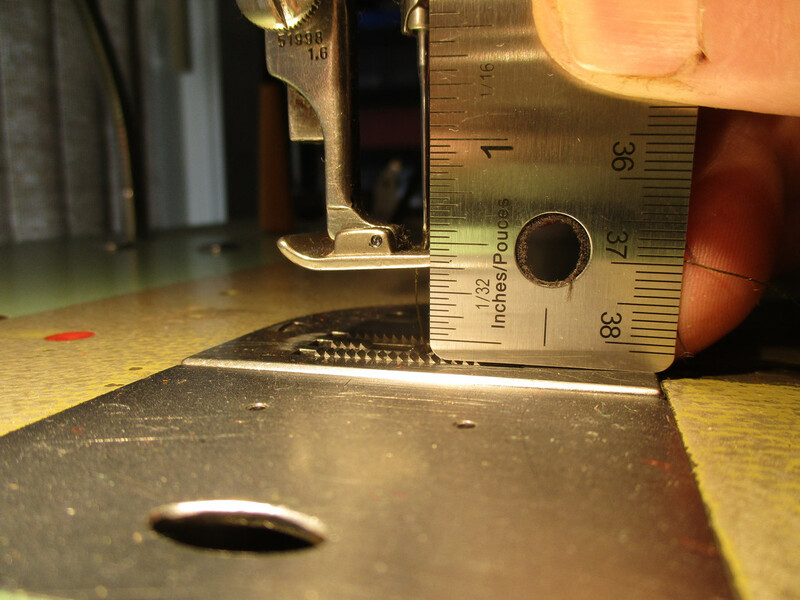 So when looking for a kilt sewing machine please ask - How high can the pressure foot be set? Look for one where the pressure foot can be set at least 1/2 inch. I have an old Singer Featherweight like that one somewhere down in the basement. It's not particularly dependable. As far as I know all the old Featherweights have an oscillating lower hook system for the bobbin thread, where the hook that catches the upper thread to form the stitch goes back and forth, back and forth. Most good machines these days use a rotary hook system, where the hook goes around and around the bobbin case. As the needle starts its upward stroke, up and out of the fabric, the hook has to catch the top thread, right behind the needle's eye and insert the bobbin thread. If it misses, the machine skips that stitch. In situations where you are possibly testing the limits of the machine's ability to sew thickness or toughness of the cloth, the rotary hook systems are usually a lot less likely to skip stitches. The Featherweight has a classic, antique look and heavy construction, but I'm not convinced that its cult status and reputation are actually based on its ability to perform in challenging situations. When you get down to actually doing the work with one, I'd personally take an awful lot of other, more modern home machines instead - Pfaff, Bernina, Viking, some Singers, some Brothers, etc. Also, don't discount the value of being able to find the instruction manual for whatever machine you get. There are a lot of them on-line as free downloads and they can save you a lot of trouble and frustration at times. I don't know about the Featherweight, I have one but don't use it. My go to machine is my 1911 model 27 treadle machine. At this point I have not found anything that I haven't been able to make using it. One of the really great things about the treadle machine is the absolute control you have over your work.